Well the reunion has come and gone. I for one looked for this weekend with great anticipation and I only wished it could have lasted longer. The reunion was a huge success as affirmed by many to me throughout the weekend. Many of our classmates played important roles in bringing things together. I will not try to mention everyone for fear of missing someone, but I must mention Terri Nash Cole for not only everything she did for this reunion, but for our 10 year reunion as well. Thank you so much Terri! The weekend kicked off with a casual cocktail party at Fincastle Country Club for some while others attended the annual Graham-Beaver football game. While I did not get to attend either event, I am told that everyone enjoyed themselves. To top the evening off, the Graham football team delivered one of the worst defeats to cross-town rival Beaver in our school history. Final score Graham 56 Beaver 8. On Saturday, several of our classmates gathered with their families for a picnic at the Bluefield City Park. The weather was perfect and the time was well spent renewing old friendships. My observation is that our classmates along with their spouses have very good gene pools because all the kids are gorgeous. Our weekend concluded with a cocktail social, dinner, and dance at Fincastle Country Club. We did not dance, but the music was a good backdrop while we reunited with our old friends. Our time was spent in deep conversation revolving around many stories from the past and present. Many photos were taken to preserve the memories. 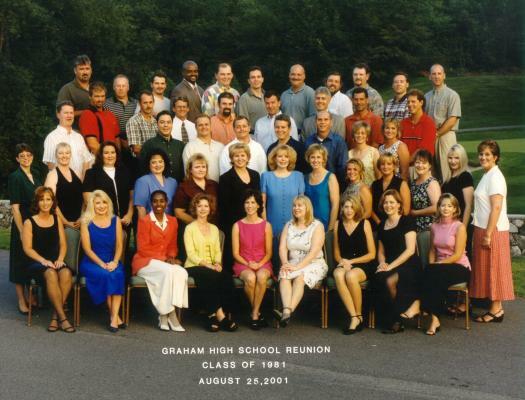 A professional class picture was taken at this event. The photo revealed that we had 49 classmates in attendance. Before we knew it the evening had run it’s course and we departed our separate ways at midnight. I received many requests throughout the weekend to have another reunion in 5 years. While I was considering when would be a good time to first mention this to Terri, she approached me with the news of her many requests for another reunion. I told her that I was game if she was. So keep your eyes and ears open; we may just do this again in 5 years. In addition, I had many requests to continue this class website. I will do so as time permits. Stay tuned for updates! I hope to add photos from the reunion in the near future. Until we meet again, I will pray that God bestow his blessings on each of you as he has for me.